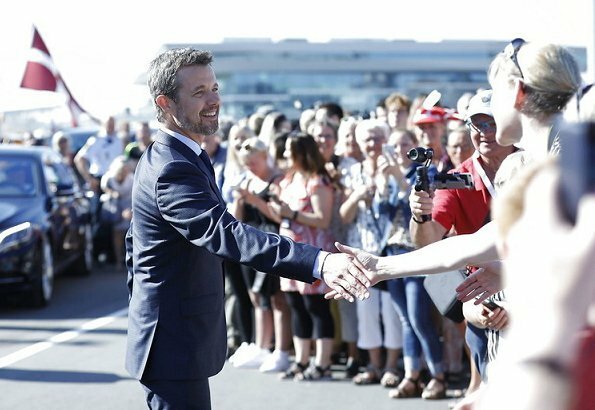 In connection with 50th birthday celebrations of Crown Prince Frederik, Crown Princess Mary and Crown Prince Frederik of Denmark visited Aarhus on May 23, 2018. There, the municipality hosted a number of visits to companies and organizations. 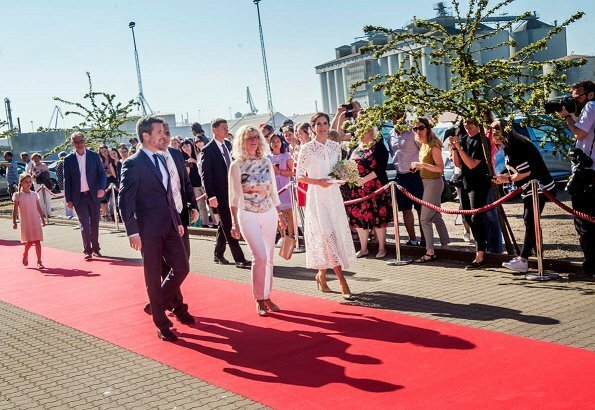 The day began with a visit to Filmby Aarhus, where the Crown Prince Couple were introduced to the city’s film, business and entrepreneur environment. 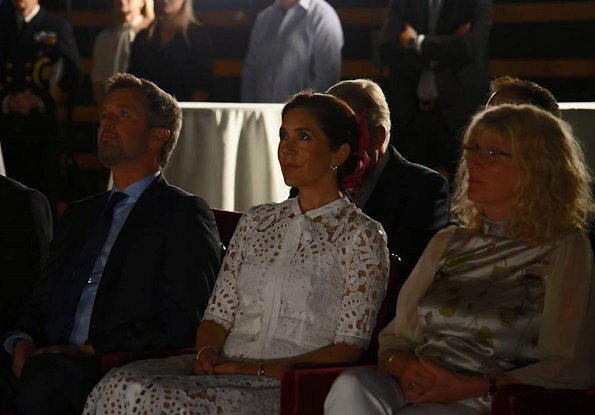 Crown Prince Frederik and Crown Princess Mary attended the opening of a new research centre at Aarhus University. 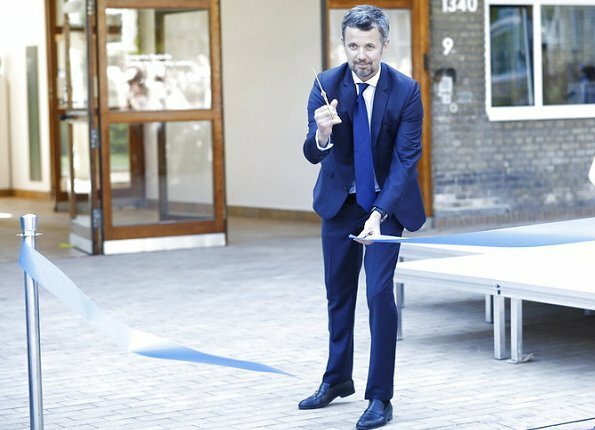 The Crown Prince presided over the opening of the centre, which was named as the Crown Prince Frederik Centre for Public Leadership. The centre will be an international power centre for delivery of research-based knowledge about public leadership and will be connected to the Department of Political Science, from which the Crown Prince received a Master’s degree in political science in 1995. CP Mary is so perfect and beautiful. She has real royal style and her aura, her smile, her confidence just make her regal. She is an insparation and an idol. She is my favourite royal. 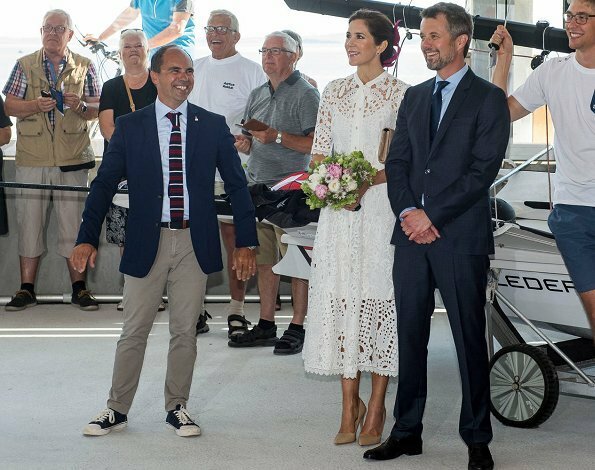 Ich bin echt begeistert von der dänischen Kronprinzessin , sie ist wie geschaffen für diese Aufgaben :Frederik hat echt viel Glück !! She looks beautiful as always. Really like this dress. She is just spot on everytime! Wonderful, but off with the bow, please. Mary's dress is just beautiful! If I could change one thing, I think it would look better with a longer lining. The absence of a longer lining draws your eye to that fact. What a handsome couple! Wonderful dress, beautiful hair. A lovely day in Aarhus and the Dannebrog as a homebase. Beautiful and elegant as always. 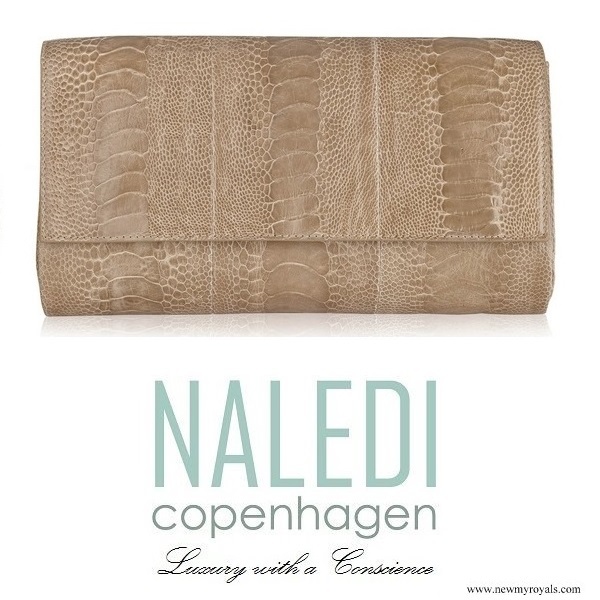 Such a wonderful dress! Mary is like a fairy tale princess. "Like a fairy tale princess" - exactly! The dress is not that beautiful on her.In fact it is a dress that are for a younger generation.Mary try to hard to have a fresh and younger look than she is,but mostly she is well dressed and sweet. 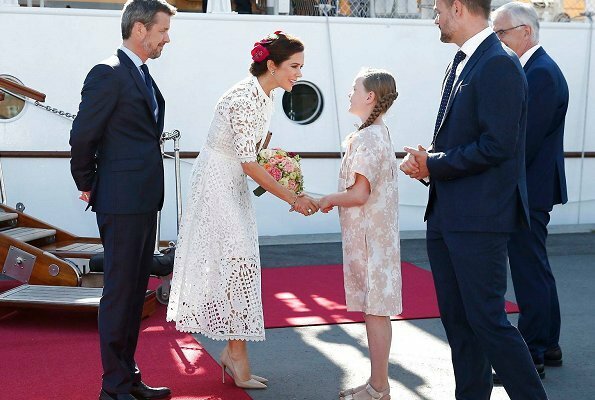 I generally love Mary's choices, and I know I am in the minority here, but I don't like this dress at all, the cut is fine and the length and sleeves are perfect, but the fabric reminds me of a tablecloth, or a doily. Love the headpiece. Mary ist eine Augenweide !! 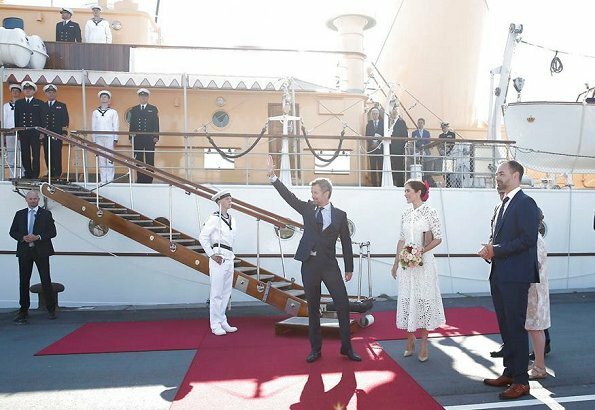 The first photo is very lovely, with the dress in profile, and the dark red head piece looking fabulous together with the crisp white dress (and the ship in the back). 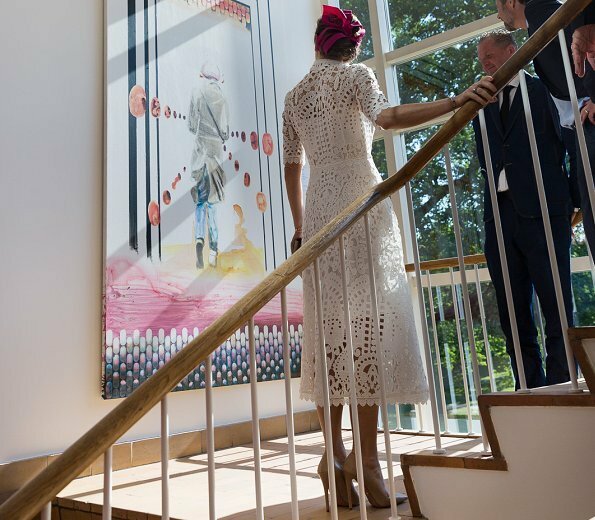 I like the fabric of the dress, it´s airy and light, but I think that the overlay in the skirt is too long relative to the lining (I´d shorten the hem to knee-length to better match the lining) Anyway, I agree that the unlined part of the skirt draws unnecessary attention. And the other thing that bothers me with this dress is all the stuff at the neckline. The bow has to go, the neckline needs to be opened up to allow the dress to breathe, and while we´re at it, the silvery buttons can go to in favour of a more disguised closure (discret zipper on the side instead?). 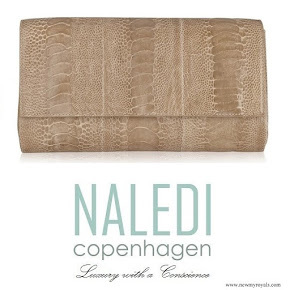 I can imagine this dress looking fabulous with a round neckline, echoing the line defined by the lining. 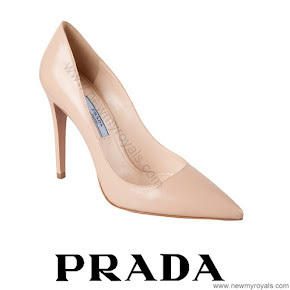 And lastly, Mary´s shoes here have insanely high heels. That´s not attractive to my eyes, and if a dress needs heels that high to look right, then its proportions are off, hence my suggestion to shorten the hem to balance things out better. CP Mary is spot on again,love it. Bello vestido sobre todo con el forro un poco mas largo. Fresh, beautiful and appropriate. Princess Mary has it "goin'on" today!! What a beautiful dress, she looks perfect. Perfection from head to toe! 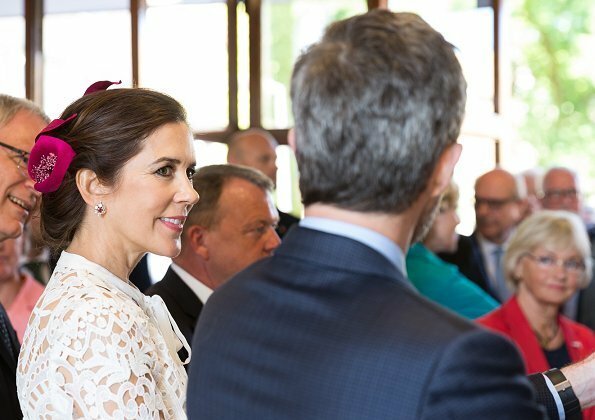 Love the dress, and the fascinator in Mary's hair is a perfect addition, just the right amount of colour.